St. Anastasia's Roman Catholic Parish, Teaneck, NJ, continues the journey of a hundred years in its unique way. Use this blog to explore the different eras in the parish. You can add your stories to the parish history using the "Comments" section after each posting. You can also enlarge pictures for viewing by clicking on them. One hundred years ago when Teaneck was dotted with farms and orchards and home to just 768 people, an 80-year old woman had a dream.Although her vision was failing, she could see clearly what Teaneck needed: a Catholic church. The woman was Anastasia Kelly, born May 11, 1828 in County Wexford, Ireland --and the church she dreamed of and founded is St. Anastasia's. 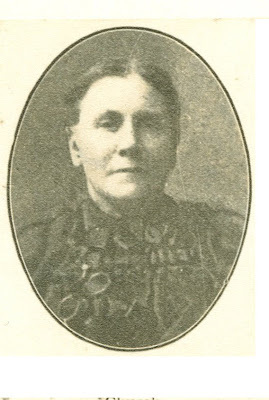 Anastasia believed the Catholics of Teaneck, most likely Irish immigrants like herself, should have their own parish rather than travel to St. Cecilia's in Englewood or to Holy Trinity in Hackensack. 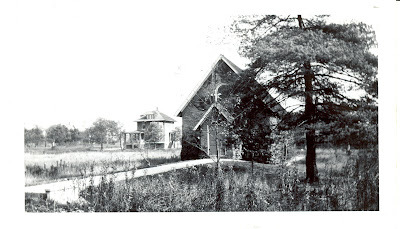 In 1906, she secured a plot of land from the holdings of her son-in-law, Walter Selvage, and built a small rectangular stucco chapel on the corner of Washington Avenue, now Teaneck Road, and Robinson Street. This was Teaneck’s second church; the first was the Presbyterian Church, built in 1906. It was dedicated on August 2, 1908. “Mrs. Manze, my sister, lived across from the Catholic Church. I remember Mrs. Anastasia Kelly. Mrs. Selvage, her daughter, gave a big piece of property to the church. It was where Rte. 4 is. I think the state gave them $40,000 or $45,000 for it when they built the highway.” Richard Verlini, Oral Histories of Teaneck, 1975. Anastasia had no idea where a priest could be obtained to organize a mission. She felt that the building, once erected, would lend credibility to her case for a priestly administrator. When her appeal was presented to Bishop John O’Connor of Newark, New Jersey, he asked the Carmelite fathers in Newark to assume charge of the new mission. It was dedicated under the title of St. Anastasia, a fourth century martyr who is commemorated in the second Mass on Christmas Day. Anastasia Kelly had expressed the wish that the church bear that name not only because she herself had borne it since her baptism, but also because of the symbolism of the martyr’s rugged courage and sacrifice. "Erected to the memory of Mrs. Anastasia Kelly, foundress and munificient patroness of this church, born May 11, 1828 in County Wexford, Ireland. She came in early youth to Brooklyn, N.Y. and resided in that cityduring the greater part of her life. Removing thence to Teaneck, the zeal for God's glory and the salvation of souls which characterized her whole life, urged her to devote a goodly share of her worldly fortune to the erection of a church convient to the residents of this town. The pious plan was happily realized and the church dedicated August 2, 1908.Owing to blindness, with which she was afflicted during the latter years of her life, she never had the pleasure of viewing the monument which she had built to her strong and noble faith. After patiently bearing this and many other afflictions she died a holy death November 9, 1909.She was beloved in life and her death lamented by all. Her mortal remains lie buried in Mt.Calvary Cemetery, Brooklyn, N.Y.Precious in the sight of the Lord is the death of his saints." Pictured: St. Anastasia's Church, 1918, in same newspaper as picture of Anastasia Kelly.